Run Fast to Help Great Harvest Customers! Words of wisdom for ALL retailers: great customer service matters! Recently Michelle MacFadyen of the Lafayette, Louisiana Great Harvest Bakery contacted me to let me know about a wonderful blog post featuring their bakery. It appeared on “Desperately Seeking Service in Acadiana,” and focused on the outstanding connection the bakery owners and employees have with customers. Below is the full text of the post, followed by a question for you. Kudos to the MacFadyens and all retailers who “get” that ordinary customer service is, well, ordinary and not particularly memorable or meaningful. The writer so perfectly describes the importance of genuine, friendly, inspired customer service. The words are relevant for any retailer who wants to be a slice above the rest. There is absolutely no way I can say this better. Enjoy! It's as if the Great Harvest Bread Company in Lafayette took the theme song to "Cheers" and made it the bakery's mantra. "Hey, (my name)!" That was not just shouted with joy by the lady near the front counter. It was the "fabulous baker boys" in the back. It was the worker that poked his head out of the office. These people are genuinely happy you are here. And it's not even 8 am yet! What's in a name? I'll tell you what's in a name--you! It's who you are, who you were, and who you've become. You would not be you without it! And when someone in a retail environment uses your name, they are differentiating you from all the other customers that walk in. And by doing that, they say, "You're unique. There's something special about you. I notice that you're special and I value you." And that's exactly how I felt. I felt valued. And it wasn't just the name; it was the enthusiasm in the "Hey, (my name)!" that knocked my socks off and continues to knock my socks off every time. We've all been to the retail store with the Pavlovian bell on the front door. It chimes or rings, and like trained dogs, the entire staff, on cue, utters "Hi, welcome to ___________." Next time you walk into this science experiment, notice the direction the employees are facing when they're greeting you--they're probably not even looking at you. In fact, most of the time, they don't even stop what they are doing. It's almost comical. They spout out a phrase that is designed to be warm and friendly. However the motion has become so routine that it is anything but warm and friendly. It's more like cold and clammy. My wife tells me all the time: "Don't tell me you love me; show me you love me!" Actions speak louder than words! And here's another action I noticed that spoke to how much customers are valued at The Great Harvest. A patron walked up to the counter and the bandanna-clad baker, full of enthusiasm, came around to her side of the counter to help her order. What?!?!? Customers mixing with employees?!?!? How can this be? The point was that too many times employees think that there should be some barrier between themselves and the customer. It becomes a transaction, not a relationship. 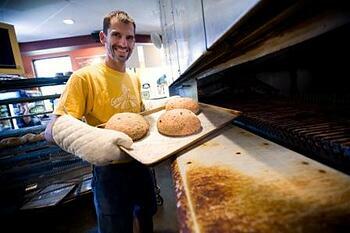 By bringing himself on the customer,s side of the counter, the bandanna-clad baker said, "I'm just like you. We're the same. Let me help you and see the world from your point of view. After all, this is a relationship." And it was evident by the look on the customer's face that she was in a retail relationship, not part of a transaction. There was no intimidation. There was no discomfort. It was as if two friends were shopping together. And instantly--she was valued! There's no secret to how the staff at The Great Harvest got my name--they asked for it! They made it a point when I first came in. And they make it a point when anyone comes in. Why? Because they have made the connection--valuing the customer makes the customer value you. And for you P&L statement junkies, it means they're going to spend more money at your place! And this concept of valuing the customers at The Great Harvest is as consistent as the delicious baked goods they produce. 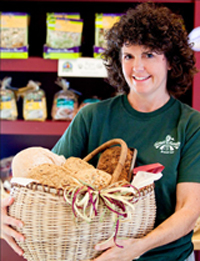 On any day, at any time, you're going to get a positive, upbeat bread specialist who will sell you baked bread and make you feel like you're doing her a favor. Gratitude. Appreciation. Warmth. You get it all every time! Kudos to the owners for hiring the right people and getting their buy in! So all of you Managers/Owners/Coaches, do yourself a favor! Go to The Great Harvest Bread Company, order a tasty muffin, get a cup of coffee and go sit at one of their tables. Watch. Listen. This is what service should look like. 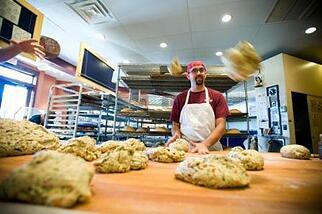 It looks like they are harvesting more that just bread at The Great Harvest Bread Company!